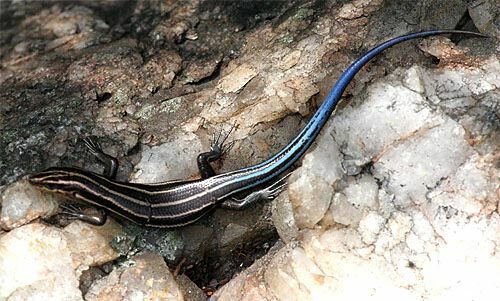 The Blue-tailed Skink, also known as the ‘Shinning-skink’ or the ‘Christmas Island Blue-tailed’, is a species of skink that is indigenous to the Christmas Island of Australia. Historical data have revealed that, these humble, non-poisonous reptiles were once feral and widespread throughout the island. Though, from around the late 1980s, these creatures started to decline in numbers across the Christmas Island. 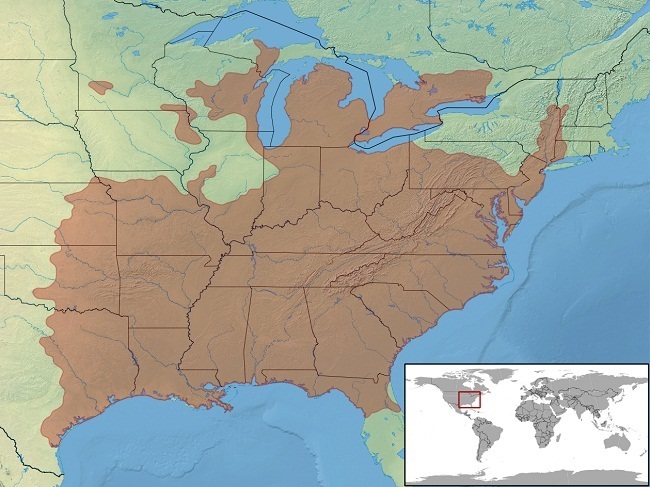 By 2008, studies revealed that, they occur in only two locations including the North West Point and the Egeria Point. While later, they started disappearing from North West Point by mid-2008 and by mid-2010, from the Egeria Point. Although, extensive studies and surveying are still on across the Christmas Island, but presently, there was no evidence of any wild populations. However, it is quite possible that, undiscovered populations still exist since Christmas Island has vast stretches of furrowed landscapes that are almost inaccessible. 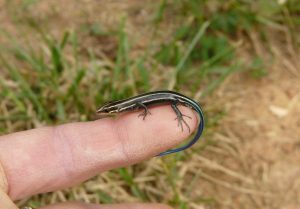 Size: These skinks are approximately 4 to 8 cm (1.6 to 3.1 in) in length. 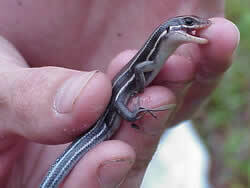 Weight: Average weight of the skinks is about 10-18 ounces. 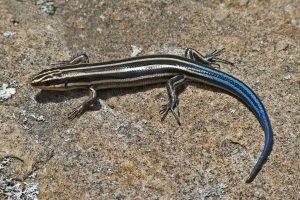 Skin/Coat Color: The baby skinks exhibit a dark black complexion with bright yellow stripes on the back of their necks that run down to the juncture of the tail. Adults begin losing their yellow stripes with age. The black back takes to the brownish side. During mating season, the neck starts growing a reddish color. Females continue to keep their blue tail throughout their life. Feet: Their feet are fairly long and are almost rectangular in shape with five claws in each foot adapted to grip branches properly. Head: The shape of their head is very much like the snake that seems to be holding a Jacobson’s organ for the purpose of sending the air while foraging. Tongue: The tongue is divided like serpents and flicks around in order to ‘taste’ the air of the surroundings. Eyes and Eyelids: Eyes are round and black, which also resemble the eyes of snakes, for which they are also known as ‘Snake-eyed Skink’. They have hidden eyelids, which refers to their fused eyelids for which they are grouped under ‘Cryptoblepharus’. Nostrils: Nostrils are situated just above their mouth and below the Jacobson’s organ. Tail: Its tail is the most conspicuous feature in the entire body. 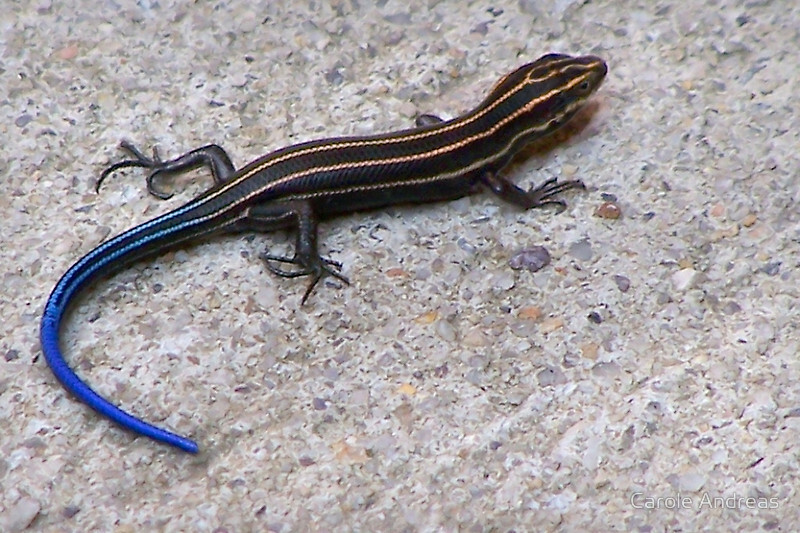 As the name suggests, these skinks, including both genders, have bright blue tails. The longevity of the blue-tailed skink is 5-7 years in the wild. These skinks, as mentioned, are mainly distributed across Australia’s Christmas Islands in the Indian Ocean. However, since its decline in population, a captive breeding population has also been maintained on the Island since 2009. Later, from this stock, yet another captive breeding population was established in 2011 that has been managed at the Taronga Zoo in Sydney. These creatures dwell primarily in forest areas, but also went feral, roaming around the suburbs, often seen on the walls and people’s fences. They love tall thickets with deciduous trees and around the coastal areas, primary rainforests, in the settlement areas, including such areas that have been left unrehabilitated by mining. No subtypes of this species have been reported. 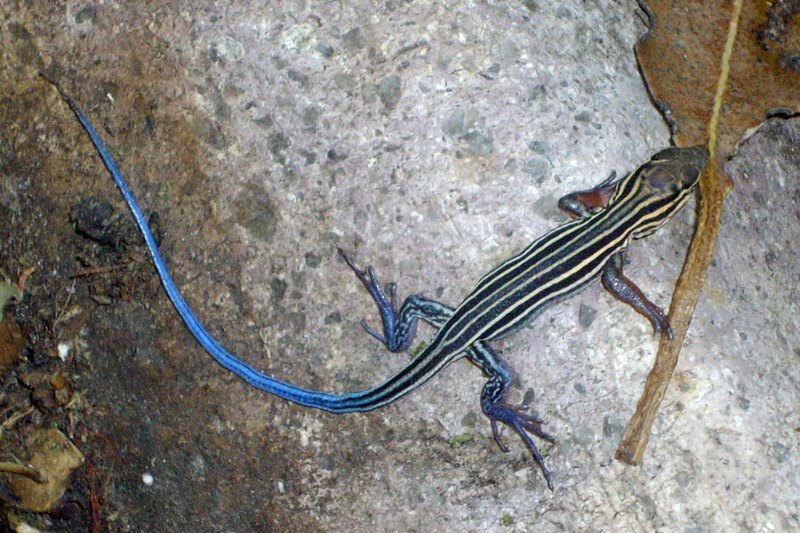 The blue-tailed skink is a diurnal lizard that would be the most active between 10 AM and 2 PM. Beyond this time range, they are seldom seen foraging or basking around. These skinks mainly bask on brick walls and stones, on the boundaries and fences, fallen tree trunks, clearings in primary rainforest, atop ornamental trees, small shrubs and even on coconut palms. These reptiles dig burrows and build their own tunnels. This is to ensure that they always have the access to a hole for shelter and protection. These skinks are good climbers, and are mostly commonly seen foraging in areas with low vegetation on the ground, on exposed rocks, in the tree canopy, low on the trunks of trees, etc., and may be exposed to predation attempts while foraging. The species is omnivorous and is a generalist predator of mostly all kinds of small invertebrates. They occur both in groups, or sometimes singly, however, the size of their individual home range is not known. They mainly thrive upon all types of available small bugs and different types of worms, like earthworms, and other invertebrates. 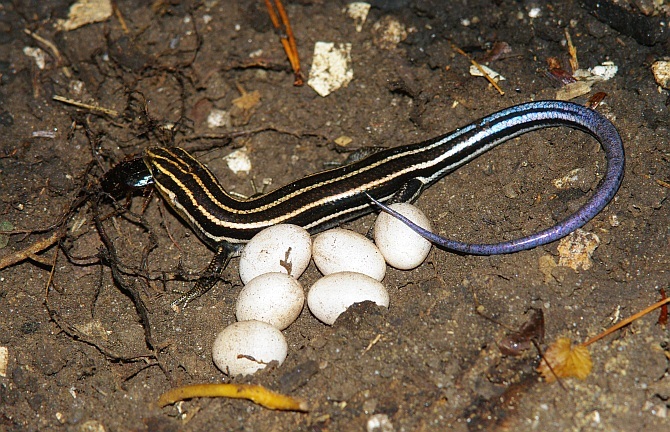 The age of first breeding of the blue-tailed skink is approximately one year. Once they attain their age of sexual mating, breeding can occur throughout the year. They are oviparous and generally lay two eggs at a time. Their hatching period is approximately 75 days. The generation length of these skinks is about 3-4 years. When these lizards feel threatened, or are attacked, they will pop their tail off. This is an instance of what is called ‘autotomy’. After detachment, their tails are able to wiggle and distract the predator while the skink would run away. 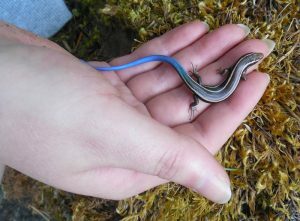 The skink can regenerate its tail. 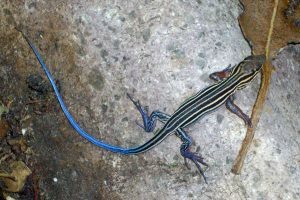 The bright blue pigmentation on the tail is to direct the attention of the predator towards it, instead of the vulnerable body of the skink. 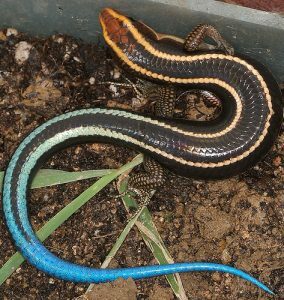 The cat, black rat, Asian wolf snake, giant centipede, nankeen kestrel, yellow crazy ant are the primary enemies of the blue-tailed skink present in the Christmas Islands. The main physical difference between the blue-tailed skink (Cryptoblepharus egeriae) with the five-lined skink (Plestiodon fasciatus) is that, unlike the five-lined skinks, the former is relatively smaller, with a black body having yellow stripes that run down to a bright blue tail. Like people often mistake, these skinks are not closely related to the Plestiodon skinks of North America, the juveniles of which are known for their blue tails. 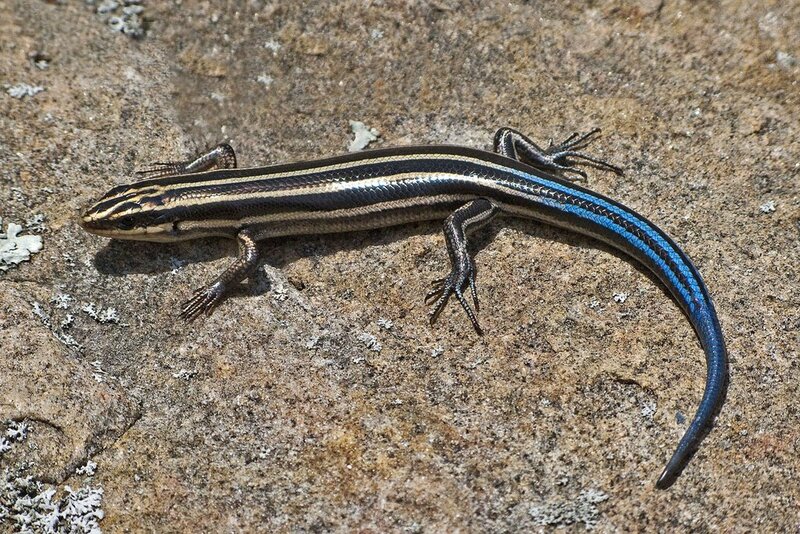 A regenerated tail of these skinks are often the color as the body (and not blue), and is also slightly shorter than the original tail. 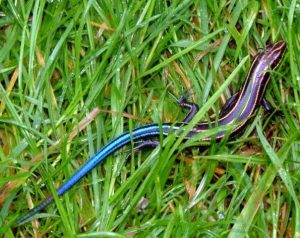 The specific name of the blue-tailed skink ‘egeriae’ is in honor of ‘HMS Egeria’, a mid-19th century ship of the British Royal Navy. As of November 2014, the number of individuals in the captive breeding populations of these skinks was over 160. I found one of these at my fence line today. I lice in Alexandria Virginia. I wonder if it got away from someone?? I took a picture of a Blue-tailed skink on 7 July 2016 at work in the office at Escravos in Nigeria. Seen one at my parents today in Illinois. Why are these Blue-tailed Snake-eyed Skink considered Endangered or Critically endangered? I see them on a daily basis here in Southeast NC, USA and have been seeing them for years. Are they just referring to their conservation status in AUS only? Hey Dave! This article is about the blue-tailed skink (Cryptoblepharus egeriae) formerly native to Australia, they have, in fact now extinct in the wild since this article was written. 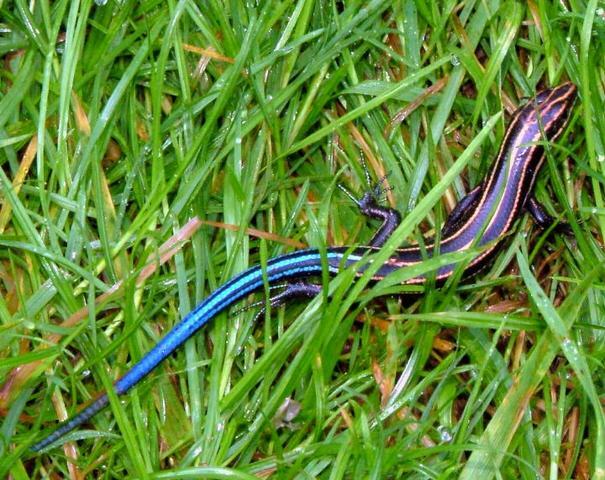 The skink you see in North Carolina is Plestiodon fasciatus.